The phonon transmission in a graphene lattice was determined using the nonequilibrium Green's function (NEGF) method. The transport system consists of a graphene lattice that was connected to semi-infinite thermal leads. These leads induce a temperature gradient across the central lattice. To achieve ballistic transport, the leads were also chosen to be graphene lattices. Through the NEGF method, the effect of the leads are easily projected to the central lattice via the self-energies Σαr. The decimation method was used to obtain the retarded surface Green's functions for the semi-infinite thermal leads gαr(ω). After which, the phonon transmission function χ(ω) was calculated using the Caroli formula for the central region. The phonon transmission as a function of ω was obtained for the first and second renormalizations of the Green's functions in the decimation method. N. J. Ferrer and C. Villagonzalo. 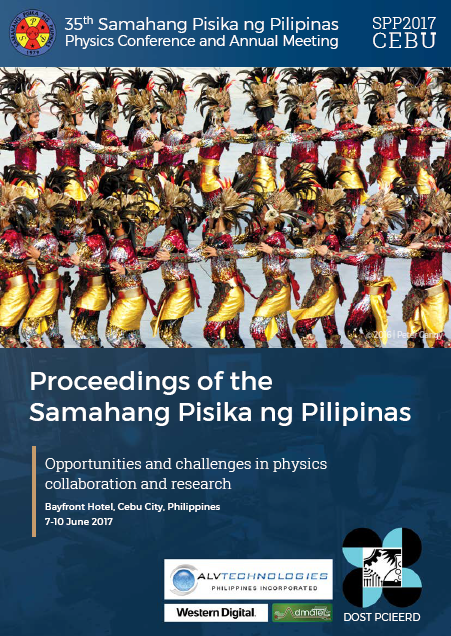 Implementing the nonequilibrium Green’s function method in calculating the phonon transmission in a graphene lattice, Proceedings of the Samahang Pisika ng Pilipinas 35, SPP-2017-1C-06 (2017). URL: https://paperview.spp-online.org/proceedings/article/view/145.